Ensure Ecobee is properly set up and configured using the Ecobee app on your iOS or Android device. Once connected, Activities can be configured to include your Ecobee thermostat. During the Harmony setup process you will be prompted to add various home entertainment and home automation devices. You may add Ecobee under the HOME CONTROL section of the add device screen. Harmony will prompt for your Ecobee username and password. Select MENU, then Harmony Setup > Add/Edit Devices & Activities. Select DEVICES and then press the ADD DEVICE button at the bottom of the screen. Select HOME CONTROL and then ECOBEE. You will be prompted to enter your Ecobee username and password. Select the Scan for device button near the center of the page. You will be prompted to connect your Harmony to your computer with the provided USB cable. Harmony will scan your home Wi‑Fi network for Ecobee devices. Ensure both Ecobee and Harmony Hub are on the same Wi‑Fi network. To access the Ecobee control panel from within the Harmony app, select the Devices in the upper right corner and select your Ecobee device. From here you can view and change your Ecobee thermostat temperature and mode settings. To access the Ecobee control panel from your Ultimate Home remote, open the MENU and select your Ecobee device. From here you can view and change your Ecobee Thermostat temperature and mode settings. Harmony allows you to set pre-defined Ecobee thermostat temperatures for each of your Harmony Activities. For example, launching Watch TV can warm up your home while Listen to Music turns off your A/C, or does nothing at all. 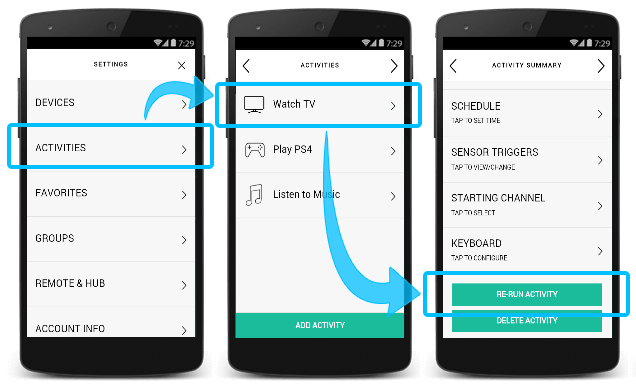 Tap ACTIVITIES and select one, followed by RE-RUN ACTIVITY. Ensure your Ecobee Thermostat is selected from the list of devices and press the > arrow. Continue through the Activity setup wizard, answering questions about your home entertainment devices. 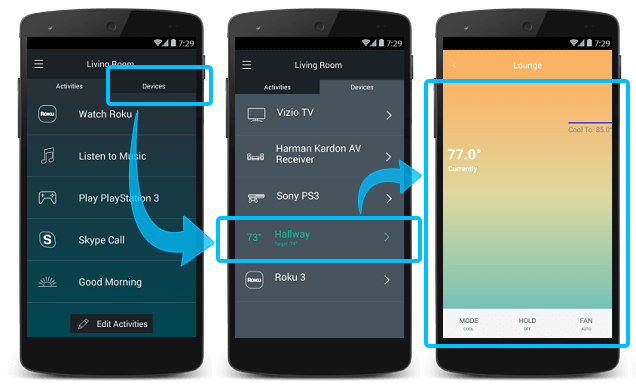 When prompted to adjust your home control devices when you Start / End this Activity, press the > arrow. Select your Ecobee Thermostat and adjust the mode and temperature values you wish to set each time you launch this Activity. Continue by pressing the > arrow. 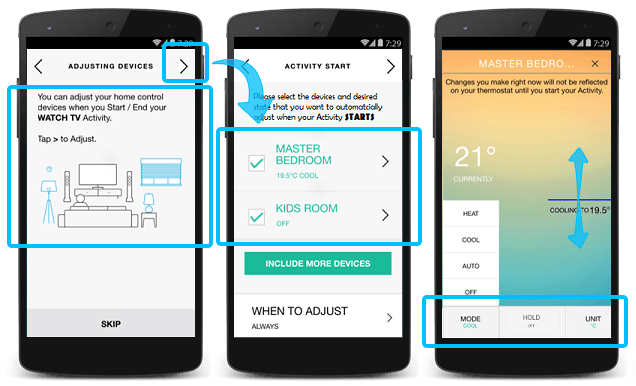 You can also choose to configure a Ecobee temperature or mode when you end this Activity. Once complete, select the > arrow in the upper right corner to sync and return to your summary screen. Repeat these steps for each of your Activities. Once programmed, Harmony will set your home temperature every time you launch this Activity. Yes. 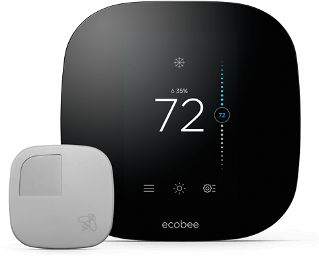 Harmony will communicate with as many Ecobee Thermostats as you have in your Ecobee account. Each thermostat will appear as a different device on your Activity home screen, and each one may be controlled or associated with an Activity independent of the others. Neither the Harmony Hub nor our Harmony servers store Ecobee username or password credentials. During authentication you are taken to a Ecobee webpage that allows you to enter your Ecobee credentials; however Harmony never sees this information. After signing in, Harmony will save a unique permission key that allows us to continue communicating with your Ecobee device. Harmony does not track when you are home or away, nor do we track any temperature changes you make. Logitech Harmony respects your privacy. Read more about our privacy and security statement. If you've factory reset your Harmony hub, changed your Ecobee password, de-authorized Logitech Harmony from the Ecobee website, or want to add a new thermostat then you must re-login from Harmony. Select DEVICES and then select Ecobee. Select REFRESH / RE-LOGIN and re-enter your username and password. Plug your Harmony remote into your computer using the supplied USB cable. 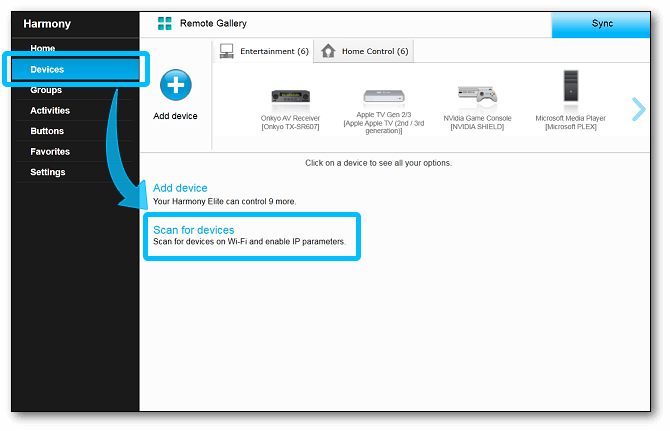 Sign into the MyHarmony desktop software and select your remote from the gallery. Select the Devices tab on the left, then the Home Control tab on the top. Select your Ecobee and press the Refresh/ Re-login button. This dialogue may appear if your Harmony hub is unable to reach the Ecobee Home cloud. Check your Wi‑Fi and internet connections. Try powering off all of your Harmony Activities, then disconnect and reconnect the power to your Harmony hub. It will take 30 seconds to power on again. Try rebooting your Harmony remote by holding the Off button for 15 seconds. Join the Harmony product management and Harmony support team in our Harmony Home Control Experience forums. The Harmony Team has validated the following Ecobee Thermostat models. Harmony communicates with Ecobee using your Wi‑Fi network. Ecobee and Harmony require a constant internet connection in order for them to communicate with one another.